Patina finish copper bar top for a commercial location. A copper bar top with patina finish with a limestone edge profile for a residential project. A curved L-Shaped zinc bar top for a commercial lounge in Manhattan. The chic lounge and bar area of Manhattan's 60 Soho Hotel features a zinc bar top with a patina finish and radius corner. Zinc bar top made for Winston Restaurant in Mt. Kisco, NY. Brooks Custom's bar tops, including this zinc bar top for a commercial project, are all made in and delivered from our factory showroom in Mt. Kisco, NY. A curved zinc bar top with a mirror polish finish. A custom raised bar top in matte finish zinc. This unique bar has a number of curves and details built into the design of the top. This custom matte finish zinc bar top was constructed and readied for installation in Brooks Custom's workshop in Mt. Kisco, NY. All of Brooks' products are made on site by skilled craftsmen and delivered to you direct from our factory. A patina finished pewter bar top with a custom edge profile. A custom pewter wet bar countertop with a rectangular integral prep sink. A matte finish pewter bar top with a stepped edge detail. A classic matte finish pewter bar top with a stepped edge profile. A stainless steel raised bar countertop with radius corners for a commercial project. An L-shaped stainless steel raised bar countertop for a residential kitchen. Raised stainless steel bar top with a curved edge. 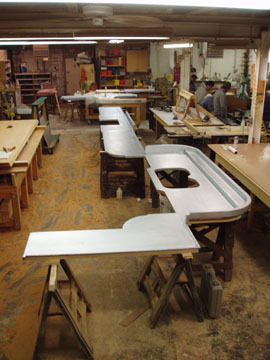 Brooks Custom's Sheet Metal bar tops are made in a number of metals and finish options. We offer Stainless Steel, Zinc, Copper, Pewter, and Bronze. All metals (except stainless steel) are available in either a matte or patina finish. Metal bar tops are a low maintenance and durable material for commercial and residential bar area. Daily cleaning can be done with Windex. For a more in depth cleaning, we recommend using a metal polish like Stainless Steel Magic, or Noxon. Zinc, Pewter, Copper, and Bronze are reactive metals that will develop a unique patina over time. You may choose to let the top age naturally and acquire its patina and 'pattern of use,' or you may choose to polish the bar top regularly to return it to its original finish. All of Brooks Custom's metal bar tops are made in and delivered to you from our factory workshop in Mt. Kisco, NY. We are a wholesale manufacturer who offers our clients direct access to our engineers and craftsmen throughout the drafting and fabrication process of your order.